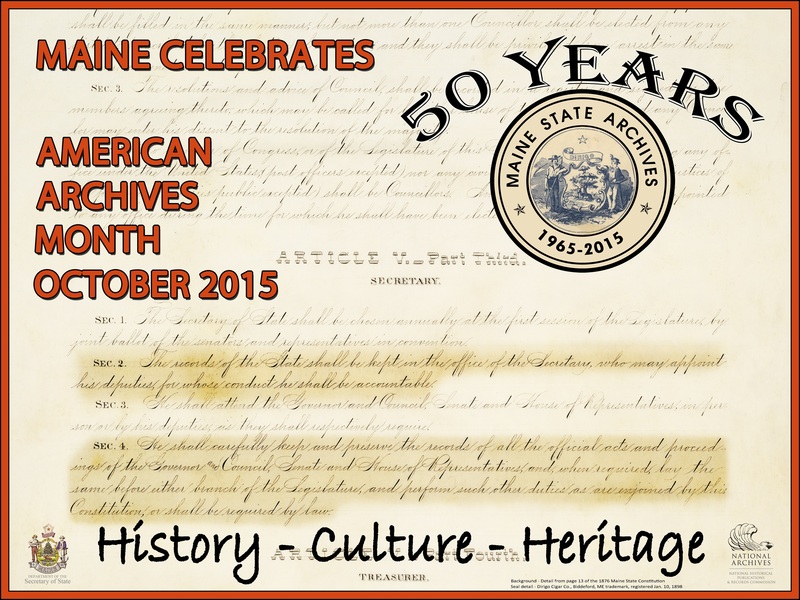 Share your American Archives Month activities: Send a note about how you are participating to saahq@archivists.org. Since 2006, American Archives Month has given the profession an opportunity to tell (or remind) people that items that are important to them are being preserved, cataloged, cared for, and made accessible by archivists. To help you participate in American Archives Month, SAA has provided members with practical information and great ideas to help make your archives program more visible. Or check out our #AskAnArchivist Day page, which details how you can participate in an opportunity to engage with the public via Twitter on October 1. This October, take steps (big or small), to reach out to your communities, make connections, and show others the significance of archives. Now in its third year, Archives Month Philly is organized by volunteers from the Delaware Valley Archivists Group and offers a dynamic range of archives-related programming throughout the month of October. Read more about our 2015 activites. 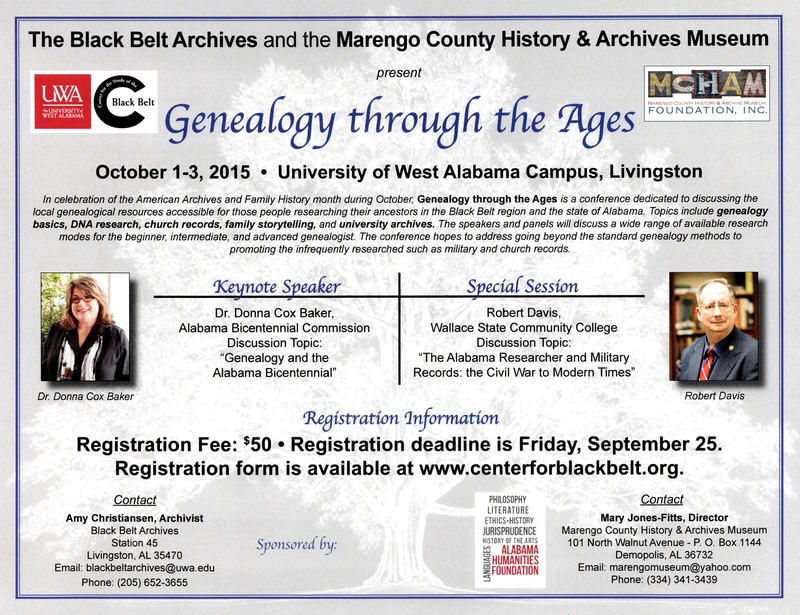 Located in Alabama, these two institutions are collaborating on a genealogy conference titled Genealogy through the Ages October 1–3. A flyer was created to promote the event. The Chicago Area Archivists will be celebrating American Archives Month this year with Chicago Open Archives: Collecting and Connecting, a three-day, city-wide open house for archives. More than twenty local archives, research centers, and cultural institutions in the Chicago area will offer special events open to members of the public. Visitors will enjoy activities such as behind-the-scenes tours, film screenings, or exhibit talks designed to showcase each site’s collections, programs, and services. Since 2001, the Louisiana State Archives has engaged in a variety of activities—presentations, symposiums, lectures, breakfasts, exhibits, and virtual tours—to celebrate archives and represent the varied interests of archivists, genealogists, historians and records managers during American Archives Month. Click here for more information and ideas. Maine State Archives is celebrating American Archives Month with extended hours for researchers, public tours, and "Detours and Details: Unearthing the History of Maine Highways at the Archives and Elsewhere," a presentation by Dr. Tom McCord, University of Maine at Augusta professor. The archives created a flyer and poster to promote the events. The Pennsylvania State Archives created a "Preserve Your Family Records" poster for Pennsylvania Archives Month--taking a very whimsical approach. 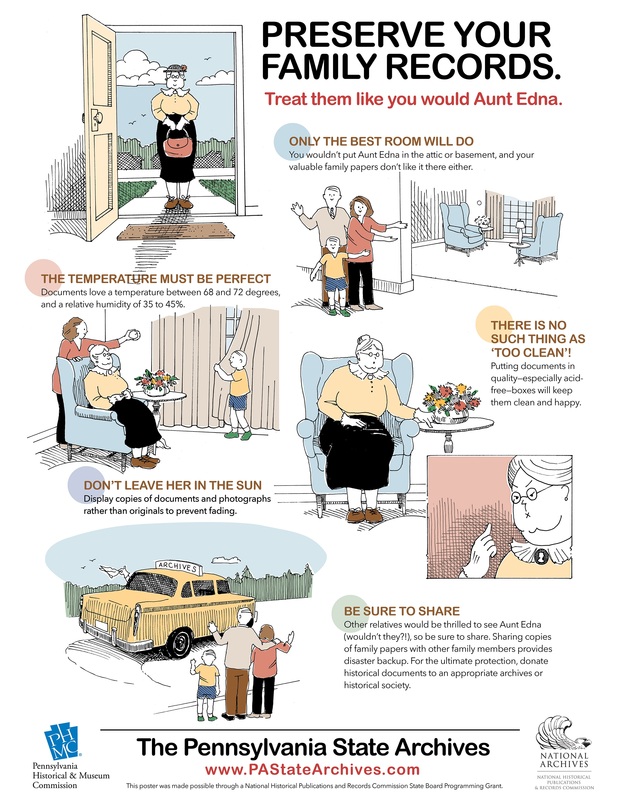 Meet Aunt Edna! October is Filipino American History month AND Archives month! The first Istorya-DC Symposium will be held on Saturday, October 24, 2015 (10am-3pm) at the Hornbake Library in College Park, MD. "Istorya" is a Filipino word for "story." Istorya-DC is an annual symposium co-sponsored by the Rita M. Cacas Foundation, Inc. (RMCF) and the Filipino Cultural Association (FCA) to support the new Filipino American Community Archives in the University of Maryland Libraries, and to share the history and research about DC-area Filipinos and their communities. More information, symposium schedule, and directions at: http://rmcacas.foundation/istorya-dc-2015.html The Rita M. Cacas Foundation (RMCF) is a non-profit, charitable organization that helps acquire, preserve, and provide access to histories, culture, and archives of Filipino Americans in metropolitan Washington DC, Maryland, and Virginia for all generations today, and into the future. The Regional History Center at Northern Illinois University is celebrating American Archives Month by presenting a special exhibit, “The Doctor Will See You Now: The History of Medical Science in Northern Illinois Communities,” the entire month of October. Visitors are invited to help celebrate the exhibit and Archives Month by joining us for our reception on October 15. The exhibit focuses on education, practice, and public and mental health in Northern Illinois between 1845 and the present. Archivists in the Commonwealth of Virginia are celebrating Archives Month with the theme Archival Treasures—Find Your Hidden Gem. Various institutions around the state contributed images for this year's poster. The public can view all of the contributed images, as well as previous posters, via the Virginia Archives Month Flickr site. In addition there is an Archives Month website hosted by the Library of Virginia. It includes a list of events occurring around the state. Proclamations facilitated by the Heinz History Center, Detre Library and Archives on behalf of the Southwestern Pennsylvania Archival Community. The First is Allegheny County Pennsylvania, the Second is from the City Council of the City Of Pittsburgh. Intriguing stories abound i​n the records housed in the Oregon State Archives. The exhibit "I found it in the Archives​" highlights some of the records unearthed by researchers, volunteers and staff that illustrate the more unique records. The DC Caucus of the Mid-Atlantic Regional Archives Conference, the National Archives Assembly, and the Smithsonian Institution Archives and Special Collections Council welcomes you to attend the 2015 DC ARCHIVES FAIR. The Truban Archives at the Shenandoah County Library celebrated American Archives month by promoting their digital initiatives. They hosted two events to promote their digital collections including a public scanning day and a digitization marathon where volunteers scanned documents between 10:00AM and 4:00PM Monday October 19th through Friday October 23rd. These programs scanned over 4,500 pages. They also participated in #AskAnArchivist day and issued several press releases and social media posts about archives. At the Rochester Regional Library Council, we are commemorating American Archives Month with two events: On October 19th, we held an Archives Month Panel Discussion, facilitated by the Technology and Training Librarian at RRLC, Tina Broomfield. The panelists presented on museum, academic, public, and sound archives and answered questions moderated by the facilitator. We heard from four different archivists, representing four different types of institutions: Kathy Connor, the Curator of the George Eastman House and George Eastman Legacy Collection; Cheri Crist, Certified Archivist, archival consultant, and Librarian at the Local History & Genealogy Division of the Rochester Public Library; Katie Lamontagne, Archivist and Special Collections Librarian at Hobart and William Smith Colleges; and Patrick Midtlyng, Sound Archivist at the Belfer Audio Archive, Special Collections Research Center, Syracuse University Libraries. On October 29th, we hosted a training event "Preserving Your Archive" with Leah Hamilton, Library Manager at the Phelps Community Library. This event gave attendees the opportunity to work with their hands creating archival enclosures for a variety of materials. Attendees were invited to bring their own archival materials to work with, and each attendee received a kit with archival preservation materials to use when creating archival enclosures. These events were popular not only with archivists in our community, but also librarians and local historians!